Deutsche Welle Release: Dozens of people were killed in twin car bomb blasts in the Somalian capital, Mogadishu, in what appears to have been a foiled attack on the presidential palace. 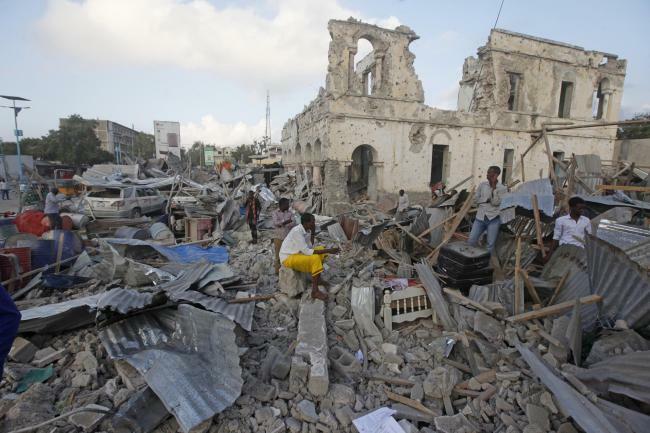 Islamist militant group al-Shabab claimed responsibility. The number of deaths from Friday's twin car bomb explosions in the Somali capital, Mogadishu, rose to at least 38, according to officials on Saturday. Al-Qaeda-linked Islamist group al-Shabab has claimed responsibility for the attack, which targeted the presidential palace and subsequently a hotel. The attacks follow months of relative calm. - A vehicle that was loaded with explosives was used to try to breach a checkpoint on the way into the presidential palace Villa Somalia, according to officials who said security forces thwarted the attack. A blast at the checkpoint was reportedly followed by gunfire. - A second explosion later, which destroyed vehicles outside the hotel as well as the compound's perimeter wall, was reported to have claimed a substantial proportion of the casualties. - The attack was claimed by al-Shabab in a statement posted online. The group, which claimed to have killed 35 soldiers while having lost five of its fighters, said it was targeting the government and security services. Security officials claimed they had been successful in thwarting the main thrust of the attack. "The security forces foiled the intent of the terrorists," the AFP news agency reported Abdulahi Ahmed, a security officer, as saying. "They were aiming for key targets, but they could not even go closer, there were five of them killed by the security force." Al-Shabab aims to overthrow the Somali government and impose its own harsh interpretation of Islamic law on the country. The group was pushed out of the capital in 2011 by an African Union force, but still controls large parts of the countryside and launches regular attacks, targeting the government, military and civilians. More than 500 people were killed in twin bomb blasts in Mogadishu in October, in the deadlie st attack in the country's history. Although al-Shabab was blamed, it did not claim responsibility for the attack.